Rainy and icy conditions in the metro on Wednesday brought long hours and plenty of work for salt truck drivers around the region. KANSAS CITY, Mo. — Rainy and icy conditions in the metro on Wednesday brought long hours and plenty of work for salt truck drivers around the region. Many roads had slick conditions as crashes and accidents were reported throughout the day. For drivers like Miles Jumps, getting a jump on the bad weather required pre-treating roads and parking lots. Jumps, who drives for Brummel Lawn & Landscape, said he filled up his truck with around 1,000 pounds of salt multiple times on Wednesday afternoon. This time of year, he said the job often involved grueling hours working in cold conditions. Drivers who spoke to 41 Action News noted that patches of rain throughout the day presented challenges with refreezing. Salt crews said patches of rain made this winter wx especially difficult. Some of the companies even needed to re-salt areas they had been to earlier this week. Despite having to work long hours this time of year, he said his crews kept others in mind. 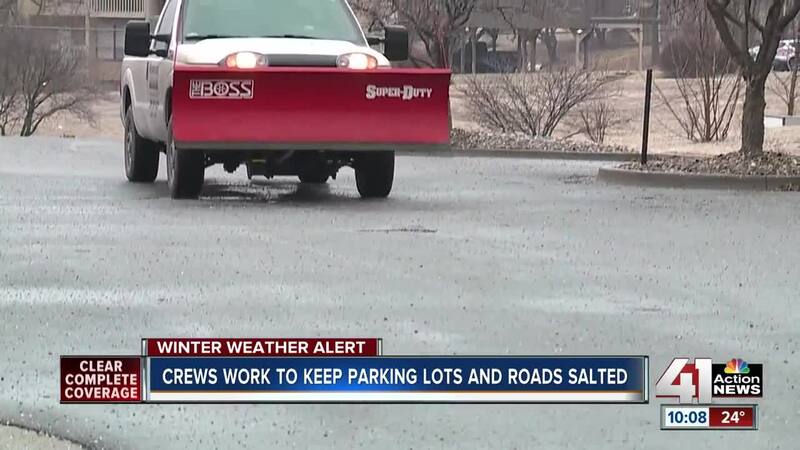 With more bad winter weather expected to hit the metro this week, the salt truck drivers said they would continue to be ready to take on the ice and cold.